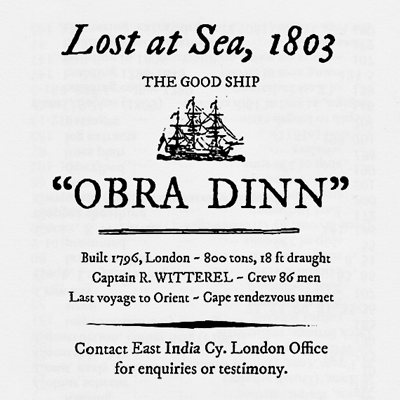 Early this morning of October 14th, 1807, the Obra Dinn drifted into port with sails damaged and no visible crew. As insurance adjustor for the East India Company's London Office, find means to board the ship and recover the Crew Muster Roll book for assessment. 1-bit rendering. "Obra" rhymes with "Cobra". Many thanks to itch.io for the hosting. 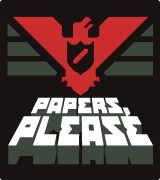 Full version now available from papersplea.se! changed or fixed for the final version. this beta does not run on OSX Mavericks or newer. 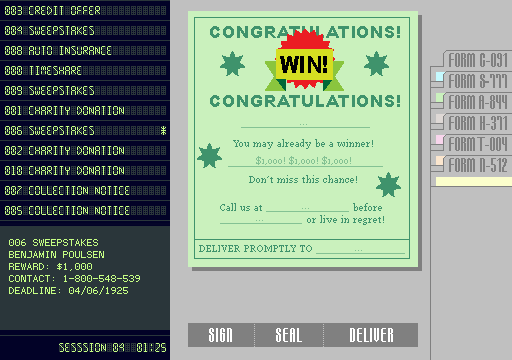 THE PREMIER FORM-LETTER MAILING SERVICE ON EARTH. This is my entry for Ludum Dare 29. 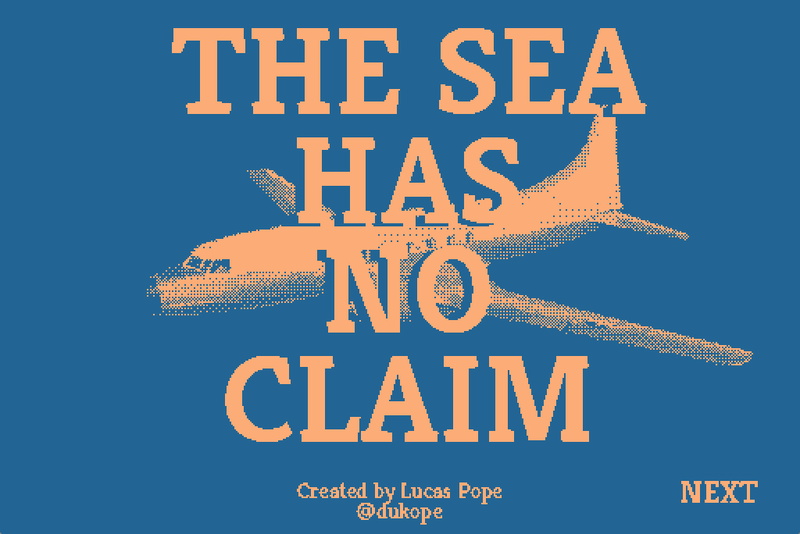 Developed in 48 hours for the theme "Beneath the Surface". One hour ago, a bomb exploded at the mayor's rally. We have gathered intelligence that implicates the Clockmaker as the mastermind behind the attack. However, the Gambler was seen placing the bomb at the rally. We believe the Clockmaker does not personally know the Gambler. There is a network of saboteurs disguised among groups of innocent citizens. 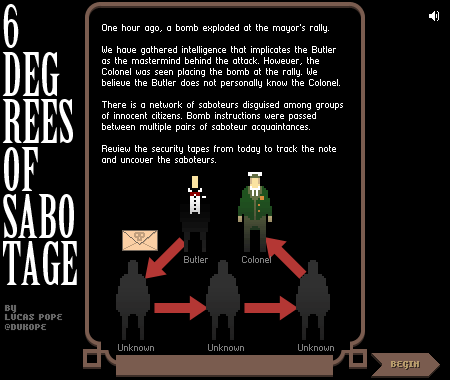 Bomb instructions were passed between multiple pairs of saboteur acquaintances. 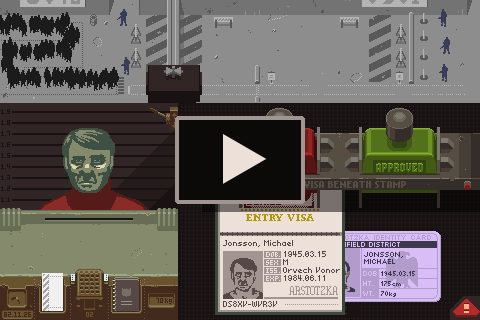 Review the security tapes from today to track the note and uncover the saboteurs. This is my entry for Ludum Dare 23. Developed in 48 hours, it's based on the idea of "small world" networks to match the LD theme of Tiny World. 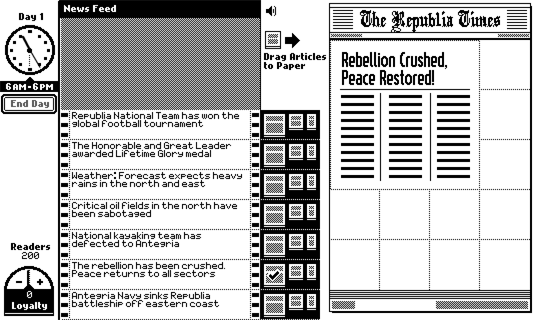 You've just been assigned the editor-in-chief position at The Republia Times in the glorious and free nation of Republia. You must use your influence to print positive articles that paint Republia in a good light. I created this as a warmup for Ludum Dare, a 48 hour game-making competition. This is my first quickly-developed game and my first Flash game. Flash debugging is a nightmare but otherwise I had fun. Flixel is great. Copyright 2012-Forever, Lucas Pope. All Rights Reserved.